Soraa, the world leader in GaN on GaN™ LED technology, announced that its LED lamps have been installed at the new Crosswater UK showroom, one of the largest bathroom showrooms in Europe. Investing in a new headquarters with a beautifully-appointed showroom gallery in Dartford, Kent, Crosswater wanted lighting to enhance a memorable experience for visitors as they moved through the showroom to discover innovative bathroom designs and superior quality products available for today’s home design. To create drama while not overwhelming guests, the lighting needed to create a sense of space, curate visitor traffic flow, and perfectly illuminate the 32 beautifully designed bathroom vignettes in the showroom. Architects Coppin Dockray and lighting designers from Lightplan chose Soraa LED lamps because of their unique ability to deliver narrow beams and perfect rendering of colours and whiteness. Specifically, Lightplan chose 635 of Soraa’s MR16 LED lamps mounted within Prospex® Spot Midi 2100-MR-SP fixtures from Lucent®, a Works With Soraa partner. The Prospex die-cast aluminium fixtures come with integral control gear and their adjustable heads accept up to two accessories held behind an anti-glare snoot. 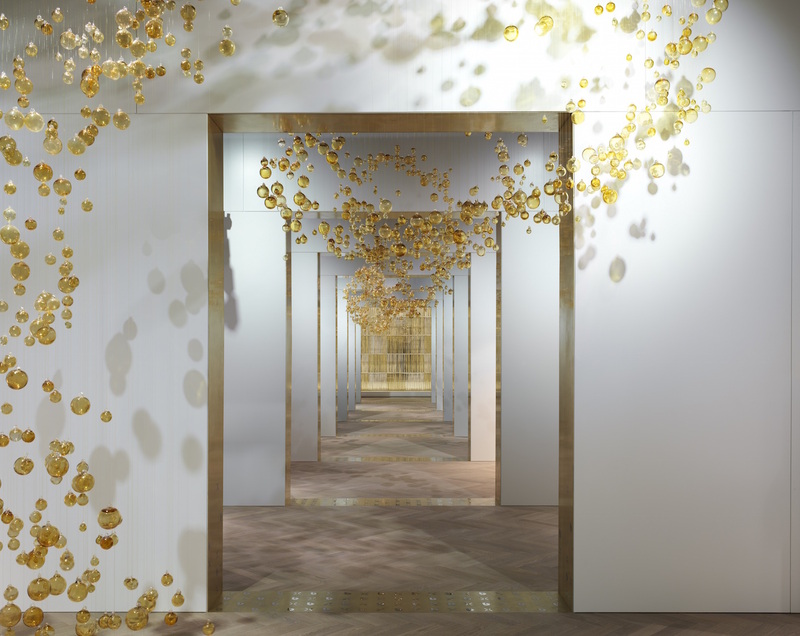 Visitors are guided through the Crosswater showroom space by a stunning “swirling walkway” of approximately 5,800 hand-blown glass spheres that hang from the ceiling and are perfectly illuminated by Soraa’s LED lamps. Because Soraa LED lamps cast strong, narrow beams from a small source, Lightplan was able to spotlight the beautiful glass spheres without light spilling over onto merchandise displays – even as a control system creates a moving effect among the baubles. “Soraa lighting makes the journey through the showroom a sensory experience for visitors. Because Soraa LED lamps provide a high intensity beam from a small source, we were able to create perfect, focused lighting on the fixtures and objects on display in each of the 32 uniquely appointed bathroom display areas. The snap on attachments, spreader lenses, are great tools to shape the light beam for a particular object preventing any spillage,” said Baris Gursen, lighting designer with Lightplan in London. The porcelain, tiles, textiles and wallpaper throughout Crosswater’s perfectly-designed bathroom interior displays also needed Soraa’s perfect lighting. With Soraa’s Violet-Emission 3-Phosphor (VP₃) LED lamp technology, Lightplan was also able to beautifully illuminate very specific architectural objects and fixtures with truer colours and varying light intensities. Utilising every colour in the rainbow, especially deep red emission, Soraa’s lamps render warm tones beautifully and accurately with a colour-rendering index (CRI) of 95 and deep red (R9) rendering of 95. And unlike blue-based white LEDs without any violet emission, Soraa’s lamps have violet emissions to properly excite fluorescing brightening agents found in elements, such as white fixtures and tiles. “Perfect design requires perfect lighting. Soraa lamps helped us illuminate our Crosswater products and display rooms as art. Every visitor to our showroom is stunned by the beauty of the space and our designs,” said Nico de Beer, Director. Crosswater UK. Lighting design credit: Lightplan, London. Architecture design credit: Coppin Dockray, London.